Hire a stretch marquee for your special event - weddings, parties, anything! What is a Temple Tent? A stretch tent is an alternative to a traditional marquee, and much more. It uses a single piece of super flexible, waterproof material developed specifically for this application to create unique spaces. The material is stretched out and poles placed to rig it off the ground. 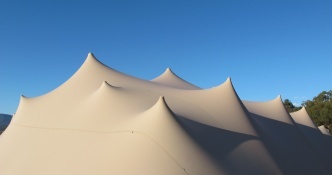 Stretch tents can be rigged in an endless variety of shapes, as well as off existing structures. Stretch tents can be rigged on uneven ground and over and around obstructions, making them the perfect solution for events on tricky sites. Stretch tents come in a range of colours, including white, red, blue, green, yellow, black and silver. The inner side of the fabric provides for a lovely soft fabric draped effect, saving on costly silk or fabric linings usually required within standard PVC marquees. They are an eyecatching design that lets everyone know a party is in progress, and look fantastic from inside and out when lit up at night. A freeform stretch tent can be rigged to make the most stylish and efficient use of any space. The tents can be rigged as stand alone structures or as canopies off any existing structure, and are unlimited in their ability to adapt to sites that aren’t suitable for standard marquees. Find out more > about What is a Temple Tent?